Charlotte Harbor National Estuary Program (CHNEP) is seeking a Volunteer Oyster Habitat Monitoring Coordinator. This is a part-time, temporary position to be hired by the City of Punta Gorda, the CHNEP's fiscal host. Applications are being accepted through Nov. 13. The Volunteer Oyster Habitat Monitoring (VOHM) Coordinator is an interdisciplinary specialist who will work as part of a team to implement the Volunteer Oyster Habitat Monitoring project. The position is primarily responsible for supporting the development of a successful Volunteer Oyster Habitat Monitoring program, recruiting and training volunteer citizen scientist to conduct oyster habitat monitoring, and producing the Volunteer Oyster Habitat Monitoring Coordinator Manual, VOHM Manual and VOHM standard operating procedures. This is a limited, grant funded position. 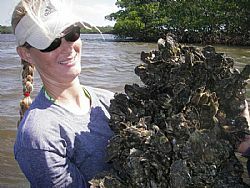 In October 2014, the CHNEP, in partnership with the FDEP Charlotte Harbor Aquatic Preserves and the Nature Conservancy, applied to FDEP for Coastal Partnership Initiative grant to support development of a pilot Volunteer Oyster Habitat Monitoring Program. In addition to recruiting and training citizen scientists to monitoring oyster habitat restoration projects, the VOHM program will include developing manuals for volunteer coordinators and volunteer citizen scientists, and establishing standard operating procedures for monitoring oyster habitat restoration projects. The time period for the VOHM project is up to 12 months. It is anticipated that the VOHM Volunteer Coordinator will be provided work space at the Charlotte Harbor Aquatic Preserve office. To learn more and to apply, go to http://www.applitrack.com/puntagorda/onlineapp/default.aspx?Category=CHNEP.